The Andrews Labor Government has delivered 110 new car parks at Ginifer Station, making it quicker and easier for people to drive to the brand new station. The Andrews Labor Government is taking advantage of the Easter long weekend to get on with removing three dangerous and congested level crossings on the Frankston Line. Construction in Ormond, McKinnon and Bentleigh will ramp up over Easter, enabling three of Victoria’s worst level crossings – at North, McKinnon and Centre Roads – to be removed months ahead of schedule. A major breakthrough has been reached between the Andrews Labor Government and the Opposition on the Delivering Victorian Infrastructure (Port of Melbourne Lease Transaction) Bill 2015. 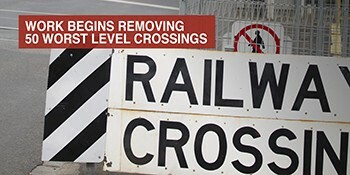 Melbourne’s most dangerous and congested level crossings cause chaos on local roads every morning.